Easter for me are the church bells ringing in the morning sun and a new Spring coat, the Tuscan Easter schiacciata from San Gimignano and the dark chocolate, the fresh pasta and the spring vegetables, the lamb and the blessed eggs. Easter is the beginning of the good season and windows wide open on rolling hills. 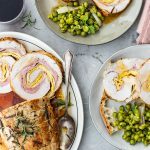 As Easter is approaching and we’re already working on our festive menu, I thought I’d share an easy and reliable roast, one of the protagonists of family lunches and cooking classes, my mum’s stuffed turkey breast. When I lived with my parents, my bedroom was right above the kitchen. It could be reached from a steep staircase, which brought up the chatter of family and friends, the laughter of my parents watching TV after dinner, the first noises in the morning, and all the aromas of my mum’s cuisine. When I was lucky, it was the subtle grumbling of the moka on the stovetop to wake me up, followed immediately by the toasted smell of coffee that would tickle my nostrils when I was still under the blankets. Most of the time, though, it was the clatter of dishes, pots and pans, and mum who unloaded the dishwasher as first thing in the morning. Sunday was different, there was a tacit agreement between my mum and me, a mute imposed on the sounds that came from the kitchen. I would often open my eyes to find the sun flooding my bedroom, and immediately afterwards I would heard the sizzling of a roast, the smell of olive oil, garlic and rosemary, the aroma of Sunday at home. Arista alla fiorentina, a pot roast rabbit, a roast beef or a stuffed turkey breast… My mum has a basic but functional cooking repertoire, and she has always had the habit to prepare lunch several hours in advance. I could tell what we would be eat that day for lunch from the first smells that would seep into my bedroom, well before breakfast. Even if mum does not believe it possible, I learnt to cook meat from her. I recognise the smell of a good roast with closed eyes, trained by years of waking up to the smell of soffritto and white wine. She has always had an empirical approach to cooking, mindlessly repeating gestures that are now a habit. She does not venture off the beaten and tested path. Over the years she has collected those recipes that work for her and for her approach to cooking, practical and effective. One of the recipes that my mum taught me and that I immediately associate with Sunday lunches is the stuffed turkey breast, roasted on the stovetop and not in the oven. It is a humble dish, but it has an enormous potential. It’s always handy to have a traditional arrosto in your cooking repertoire. 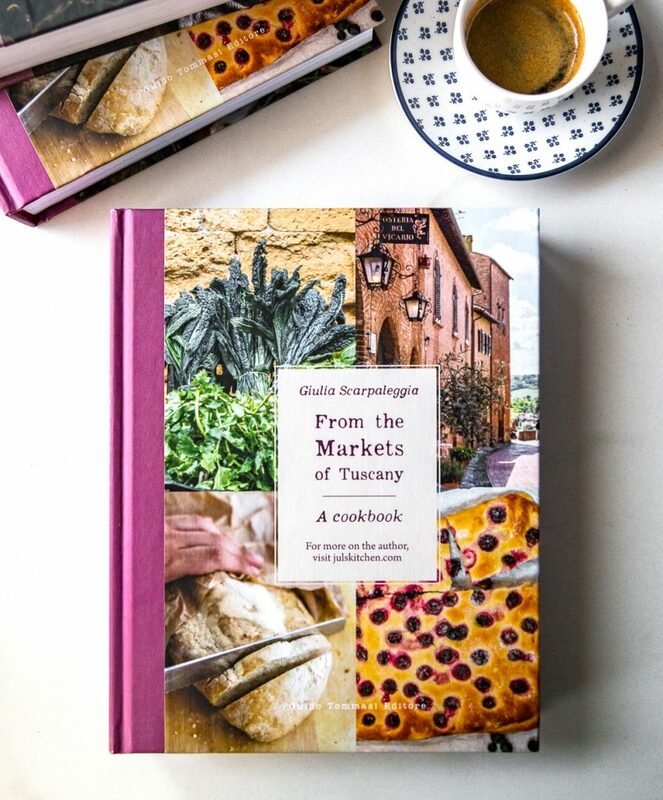 Two years ago I decided to share these recipes, staples of a Tuscan repertoire, analysing the ingredients and the process with plenty of details so that, if you want, you’ll be able to include them into your collection and make Tuscan cooking your signature style. After the crespelle alla fiorentina and the eggplant meatballs, after the ricotta and kale gnudi, after one of the desserts you loved the most, a humble Tuscan apple olive oil cake, and the summer baked eggplants with a breadcrumb topping, after the Tuscan ragù, I want to share with you the recipe for a stuffed turkey breast. The turkey breast on its own – take a grilled turkey breast slice for example – is pretty sad. It’s lean, true, but it doesn’t have a great taste. Moreover, it is easy to overcook it, ending with a dry and stringy piece of meat. When I think about my mum’s stuffed turkey breast, though, it reminds me of festive days and long tables with the family gathered for a meal together. It is a juicy and tasty meat. It makes me reach for a slice of bread to mop the sauce left at the bottom of the pan, made with extra virgin oil, white wine, melted cheese and meat juices. In short, for us who do not have the tradition of roasting a whole turkey to celebrate a festive day, the turkey breast is the most convenient choice: a lean, cheap and versatile cut of meat. As you will see in the recipe, I prefer cooking the turkey breast on the stove top rather than in the oven. I can better control the cooking time, which is shorter, and, above all, the result is a juicier stuffed turkey breast. 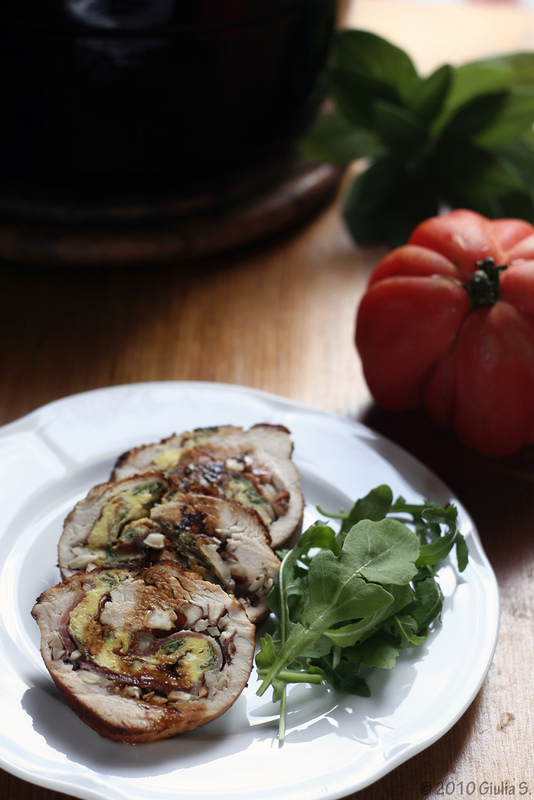 This stuffed turkey breast with cooked ham, fontina cheese and an omelet is a juicy and tasty meat. It makes me reach for a slice of bread to mop the sauce left at the bottom of the pan, made with extra virgin oil, white wine, melted cheese and meat juices. If you don't feel like butterflying the turkey breast, opening it like a book, ask your butcher to do it for you. Beat the eggs and season them with a pinch of salt and pepper. Pour the beaten eggs into a hot pan greased with a teaspoon of olive oil and make an omelet. Cook it on both sides – use a plate to flip it -, then slide the omelet onto a plate and let it cool down. Place the open turkey breast on a board and season it with salt and pepper. Place the cooked ham and the fontina cheese on the turkey breast. You might want to leave an inch without stuffing on the short edges of the turkey breast, as it will be easier to roll it. Finally, add the omelet: if it is too large, trim it and add the pieces left in the filling. Wrap the turkey on itself, starting from the short side, pressing well as you roll it up, taking care that the filling remains well sealed inside. Now tie the turkey breast with the butcher's twine: cut many pieces of string long enough to tie the breast on the short side, about 1 inch apart. If needed, tie the turkey breast also lengthwise, folding the turkey meat on the opposite edges as if you were tucking the blankets on a bed. Place a few sprigs of rosemary under the string, it will release its wonderful aroma while cooking. Pour the olive oil into a pan large enough to hold the turkey breast. Be generous, depending on the size of the pot, you could use several tablespoons of olive oil. When the olive oil is hot, place the turkey into the pan. Sear the meat it over medium heat until it becomes golden brown, then turn it with two wooden spoons, so as to brown it on all four sides. It will take about ten minutes. When the turkey breast is golden brown on each side, pour a glass of white wine over it. Let it evaporate for a few seconds, then immediately cover the pan with a lid. The moisture of the wine will cook the turkey. Move the pot over very low heat and cook the turkey breast for about 25-30 minutes, checking towards the end to prevent it from drying too much. If you have moved the pan to a minimum, there should be no problems. Now turn off the heat and let the turkey rest in the pan for at least an hour. Thus, the residual heat of the pan will finish to cook the turkey, leaving the meat juicy and tender. Do not skip this part, otherwise the turkey will not be cooked properly. Now you can choose whether to serve the turkey immediately or wait until it is completely cold. If you prefer thin and nice slices, wait until the next day and stash the turkey in the refrigerator. Once the turkey is cold, it will be much easier to slice it. To warm it, do not heat the turkey itself, which would otherwise become too dry. Heat a serving dish and place the sliced ​​turkey on top, then heat the cooking sauce on the pan and pour it over the turkey. This will be enough to warm it up. Once you find a good butcher, befriend him. There you will find good and possibly local meat, he will answer to your questions about the best cut to use for a recipe and, most importantly, he will also be able to butterfly the turkey breast for you to stuff it. From here, it’s all downhill. You can change the filling depending on the season, on the occasion and on what you have in the pantry. The most classic filling is that of today’s recipe, with prosciutto cotto, cooked ham, fontina and an omelette, but just follow the season and your taste. Remember that the omelette will give moisture to the filling, and that it is preferable to opt for cheeses that melt, but do not release too much liquid. So yes to fontina, scamorza and fresh pecorino, while it is better to avoid mozzarella, stracchino or robiola. Smoked ham, or speck, and smoked scamorza cheese. Tommaso’s favourite combination. Grilled eggplants, cooked ham and scamorza cheese. Grilled eggplants have the same role of an omelette, making the filling moist and tasty. Sausage, diced apple and dried chestnuts. 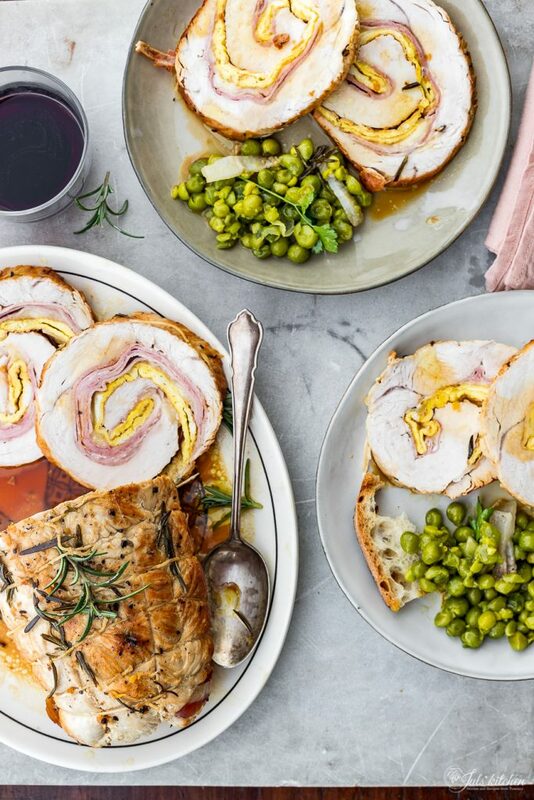 A demonstration that even a simple turkey breast can be dressed up for a party. Let’s start thinking about a possible Easter menu, what do you think? I’m feeling quite traditional, I like the idea of choosing recipes both from the Sienese and the Florentine area, this makes me feel at home. We can open the festive lunch with the crostini neri, that belong to my family tradition, and continue with the crespelle alla Fiorentina, replacing the spinach with asparagus. Our main course will be my mum’s stuffed turkey breast, with a side of fresh peas cooked with garlic and pancetta. Finally, a semolina and chocolate cake, which I associate with Easter since I met Tommaso. Chicken liver spread for crostini. The sweet smell of butter that soften the chicken liver reminds me of happy days, early Christmas mornings or my birthdays in summer. It surrounds you and brings you into the middle of the Tuscan countryside. It is supposed to be spread on toasted Tuscan bread slices, just forgive any other refined bread. You can soak the bread with chicken broth (as my Aunt Silvana does), butter them (as grandma does) or use them as they are (as my mum does). Crespelle alla fiorentina. It is a handy recipe to learn as you can vary the filling according to the season: asparagus, artichokes and butternut squash are some of my favourites along with spinach and Swiss chard. You can mix the vegetables with fresh milky ricotta or add some béchamel into the filling. Cheese is a welcomed ingredient: Parmigiano Reggiano, Tuscan or Roman Pecorino, ricotta salata, or any other savoury aged cheese that you would happily grate over your pasta. Semolina and chocolate tart. Chocolate and semolina are two ingredients that apparently have two completely different lives. The first is the king of the most spectacular desserts, dark, deep, sometimes mysterious and reserved just for the grown-ups. The second one reminds childhood, simple food, motherly cuddles. They meet and fall in love in this tart, two different layers, but well-balanced. It has a homey, familiar character, as each tart made with short pastry. Listen to the second episode of our podcast, Cooking with an Italian Accent: we talk about roasts and the rules to cook them properly. In the podcast it was a roasted pork loin, but when it comes to roasting a piece of meat on the stove top, you can apply the same principles. Spring is a busy season for food related books, I have the longest list of books I want to read (Bee Wilson, Joanne Harris, Jenny Linford to name a few authors on my list). One of the books I am most excited about is Ruth Reichl’s new food memoir, Save me the plums. Here you can read an article about her memoir. What are you reading now? What’s next on your list? M.F.K. Fisher and the Art of the Culinary Selfie. This is about the great food writer M.F.K. Fisher, about how she wove food and life (and death) and about the role of food memoirs in our culture, yesterday and today. The Italian Woman Who Changed Home Cooking Forever. Another article on food writing, dedicated to the Italian Anna Del Conte, who had the same role in England as Marcela Hazan had in the United States in making Italian cuisine famous. She is one of Nigella Lawson’s favourite authors, too.